RAWALPINDI: The Rawalpindi police will be deploying as many as 1,100 police officers in Hassanabdal to ensure security for the three-day Sikh festival Baisakhi. The festival will be celebrated from April 12 to April 15 and the district administration expects a large number of Sikhs from within the country and outside to visit the area during this time. 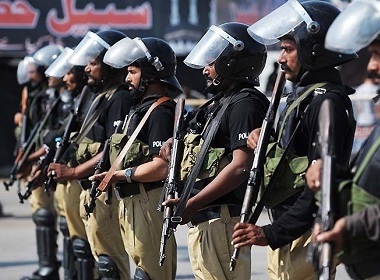 As per a security plan devised by the Rawalpindi police, some 500 policemen, equipped with latest weapons, including 36 elite commandos and 25 lady police officers, will be deployed from Rawalpindi, Chakwal and Jhelum districts as part of the security arrangements, while 1,100 police officers will perform duties in shifts during the festival. Rawalpindi Regional Police Officer (RPO) Ahmed Ishaq Khan has written to the Rawalpindi City Police Officer Abbas Ahsan and District Police Officers (DPOs) of Chakwal and Jhelum. In the letter, he asserted that Sikh pilgrims from across the world, including India, UK, USA, Canada, Germany and other countries are scheduled to descend on Hassanabdal — where Panjasahib is located — for the Baisakhi Mela. RPO Ahmed ordered to deploy 100 senior officials, 400 constables, 25 female constables and 36 elite commandos. He further directed to divide the deployment schemes as 40 upper sub-ordinates, 200 constables, 15 women police officers, and 12 elite commandos from the Rawalpindi district, 20 upper sub-ordinates, 100 constables, five women police officers and 12 elite commandos from Jhelum district and a similar number of police officers from Chakwal district. Moreover, the additional police force will be sent to assist the Attock police to ensure full proof security of the Sikh pilgrims who will be coming for across the country and the world to participate in the Baisakhi Mela. RPO Ahmed emphasized to equip these officers with the latest weapons and essential equipment. The officers have been ordered to carry their identity information along with them. The list of the deployed personnel will be provided to the Attock DPO while the Attock Investigation SP Taimoor Khan, will supervise all security arrangements. However, the Attock DPO will be responsible for the overall supervision of arrangements.